A lyrical verse in praise of Durga, the Hindu Goddess of Protection, Aum Dum Durgayei Namaha is an ode of invincible support. First introduced in the Rig-Veda, Devi Durga is a female manifestation of Brahman that emerged from the cosmic dance (Lila) or what is described as a “pool of light”. Like Lord Shiva, Mother Durga has three eyes to elucidate broad vision, execute pure precision and exemplify truth. Typically shown riding a lion or tiger, Durga’s has many arms with many weapons. Her first blow to Mahishasura (The menacing Buffalo Asura who defeated the King of Gods and terrorized Heaven and Earth) came through laughter so strong it drove an earthquake under his feet. In many epic battles to follow -- she succeeded in fully dismantling him through thunderbolt convictions, the spotless sword of knowledge and her ultimate trident. The Aum Dum Durgayei Namaha mantra calls upon this ancient storytelling to summon the supreme strength of Durgāpadvinivārini (the dispeller of difficult adversities) to support us in the here and now. This eight- syllable powerhouse wraps our worries in the “U” sound considered by many spiritual paths to represent the sacred name of God. Thought to activate both the heart and crown chakra it is easy to feel the potency of this vibrational prescription. Surrender to the one who destroys difficulties to triumph in acts of virtue and faith. Our hands have the highest number of pressure receptors in the body and exert a powerful influence on our overall rhythm. Pulsing the thumb pads with each individual finger for a count of eight sets a hypnotic tempo and reinforces a state of relaxed alertness. 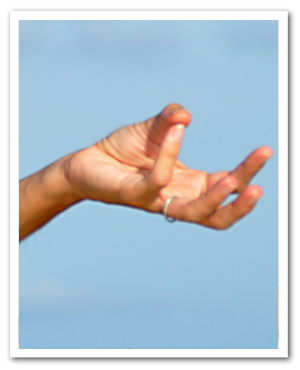 Finger Tapping Mudra activates the felt sense by establishing a steady cadence of drumming between the finger pads. Release the need for perfection. Channel wholeness even when things feel broken. Nourish the Spine. Undulating opposition weaves a path for the invisible – like a double helix dance between two strands of pearls. A grain of sand within the shell causes much irritation but may also give birth to an organic gem. Breathe the Leg Lines. Inhale, pull energy up the lateral leg lines and exhale, push energy back down the medial leg lines. 5 breaths. Inhale, circle arms overhead and set gaze high. Exhale, ground the feet and empty the triangle. Maintain stand tall position --tap thumb pads with each finger 8x. Breathe Naturally. Exhale, allow arms to cascade down toward the floor and rest by sides. Close eyes. Notice the echo of sensations in the fingertips. Breathe naturally. Inhale arms overhead again. Repeat tapping (#4) and recite Aum Dum Durgayei Namaha per 8 taps. Exhale, allow arms to float down to sides. Observe the echo. Breathe naturally.